Gardening is like going to the casino these days with global warming causing such wild fluctuations in our weather. Spin the wheel and you may get to make Bread & Butter Green Cherry Tomato Pickles, but you have to be lucky. You’re lucky if you have a veggie garden or at least a place you can grow some tomatoes in containers. You’re really lucky, if a few of those tomatoes fall on the dirt and “volunteer” the following year in the shape of tomato seedlings. I feel very lucky and am extremely grateful for having a garden. I grow a wide variety of tomatoes; last year I had about 25-30 plants going, which is a lot in a New York garden. I buy what I call uppity tomato seedlings from the my favorite organic farmer, Trina, who runs Silver Heights Farm at the Union Square Greenmarket. Her catalogue has hundreds of tomatoes and other veggies. It’s often hard to control myself because I want them ALL. I pop them in and hope they will grow up to the expectation that the catalog description has lured me with. But some of them don’t make it. LUCKILY, I have the volunteers—my surprise gifts from Momma Nature. They just show up or grow from the compost pile. I rarely know what kind of tomato the seedlings will turn out to be. Even if I could remember the tomatoes I grew last year, they often revert or hybridize, so you NEVER know what you’re going to get. It’s tomato roulette. The other benefit of the volunteers is their heartiness. They’re tough. They grow like weeds with very little soil—I’ve seen them growing out of bricks. They always fruit and often go like gang busters. Frequently, I have more than I can fit in my garden so I pot them and invite friends, neighbors, even strangers to come and get them. I have a no-tomato-left-behind policy. Last summer, 2013, was a weird one, weather-wise. Many of my gardening friends had very poor tomato yields. At least six of my uppity tomatoes dropped dead, but I popped volunteers in their place and they flourished. I wound up with several cherry tomato plants. Did I mention that I NEVER plant or buy cherry tomatoes? These plants grew into what can only be described as tomato hedges. PROLIFIC!!! I had tons of tomatoes, and right before the frost I had a ton of green cherry tomatoes to put up. 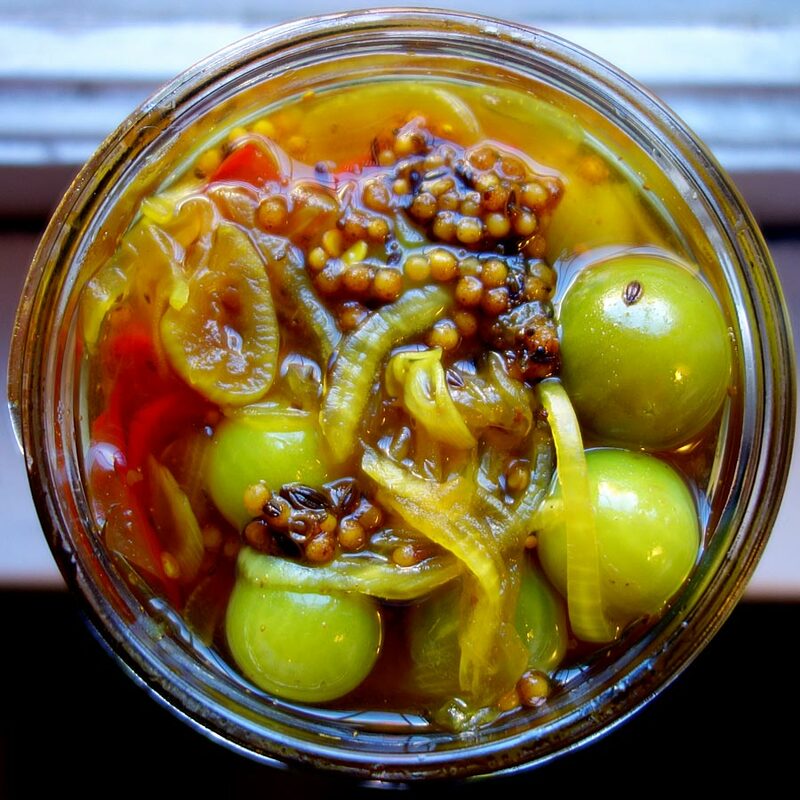 I made my 4G chutney and whipped up Bread & Butter Green Cherry Tomato Pickles. I’m still eating them today as I look into my garden where the uppity tomatoes I got last weekend are patiently waiting for their premium spot in the garden. Oh, and there are plenty of scrappy volunteers popping up around the garden vying for spots, too. What will they be? Check back with me at harvest time. The end of the harvest of 2013, I had what seemed like a zillion green cherry tomatoes that I “put up”. Since I love bread and butter pickles made from cucumbers I figured green cherry tomatoes would be a treat ‘bread and buttered”. Wash and drain the cherry tomatoes. With a toothpick, poke six holes in each cherry tomato. Mix cherry tomatoes, onions and red pepper and salt in a large bowl. Cover with two trays of ice cubes. Set in the refrigerator for four hours or overnight. The next day, drain off the liquid in the bowl. Rinse the vegetables under cold running water and drain well. Combine sugar, vinegar, turmeric, mustard seeds, celery seeds, dill seeds, crushed red pepper flakes in a large pot. Bring to a boil and boil for 10 minutes. Add drained vegetables to the pot. Bring to a boil and remove from heat. With a slotted spoon pack vegetables into hot sterilized jars. Place pot of brine back on the stove at a simmer. Add three black peppercorns and two allspice berries to each jar. Pour hot brine over the veggies in each jar leaving about 1/2 inch space between the vegetables and the lid of the jar. Place flat lids on each jar. Screw on bands to seal, but don’t over tighten them. I used Vidalia onions. I’m sure you could use sliced or quartered green tomatoes for this recipes as well, if you don’t have a windfall of cherry tomatoes.